OBJECTIVE: 4 Kidz | Draw Lambuel! 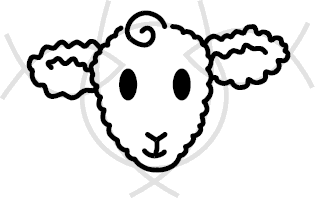 Lambuel & Friends Kidz Crafts Kidz Artwork Gallery Dress Up Lambuel! 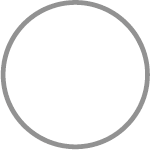 Using light pencil lines, draw a circle. You can trace a jar or other round object to make circles, or you can use the method that Hiram of Tyre showed his friend Solomon (1 Kings 7:23 — Substitute inches or centimeters for cubits). 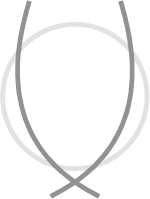 Draw two arcs through the circle like the ones shown. The first arc will remind you of the Ark that Noah used to save all our ancestors from the Flood (Genesis 6-8). The second arc will remind you of the rainbow that God used as a sign of His promise to never drown everyone again (Genesis 9:8-17). 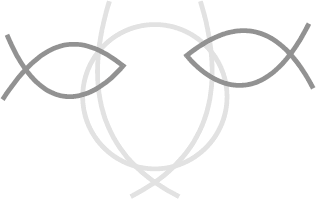 Draw two Jesus Fish facing each other like they are secretly talking. Back when people were mean to those who loved Jesus, these fish were used as secret signs so Jesus's friends could identify each other. Now they are used to advertise Christian owned businesses or to warn unsaved motorists of cars that might be dangerous when the Rapture comes. Isn't that neat? Draw my eyes, so I can see the Light (1 John 1:5-7); my ear lines, so I can hear the Good News (Romans 10:17); my mouth, so I can tell people what I heard (Mark 16:15-16); and my nose, which is shaped like a Y or a person joyfully raising their arms to Heaven. Also draw my curl. It should spiral the same direction as a 6, because that's how many days God took to create EVERYTHING (Genesis 1)! 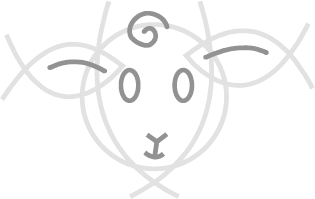 Using a dark line, outline my ears and the sides of my head with squiggly lines that look like wool. 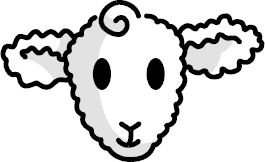 Did you know that Jesus has white wooly hair just like me (Rev. 1:14)? Use smooth lines on my chin, nose, mouth, and curl and then fill in my eyes. On the seventh step, rest and pray to God! Thank Him for giving you the ability to draw me!